Leading Exporter of flux coating dies from New Delhi. We offer different sizes of Flux Coating Dies also called as extrusion die in affordable price range. We make these dies in different sizes as per the machine type. Like 15 x 20 , 15 x 18 straight , 15 x 18 with steel case. They are basically applicable in the extrusion of welding electrodes. In our product we are using high quality materials procured from trusted vendors. Our extrusion dies are giving a broad range in terms of their use. 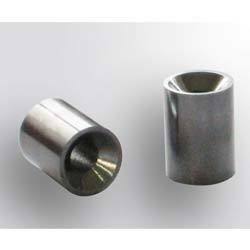 These dies are applicable in the wires and structural components. Looking for Flux Coating Dies ?